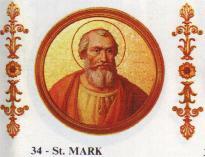 ST. MARK was by birth a Roman, and served God with fervor among the clergy of Rome. He advanced continually in sincere humility and in the knowledge and sense of his own weakness and imperfections; and every day he strove to surpass himself in the fervor of his charity and zeal, and in the exercise of all virtues. The persecution of Diocletian ceased in the West, in the beginning of the year 305, but was revived a short time after by Maxentius. St. Mark abated nothing of his watchfulness, but endeavored rather to redouble his zeal during the peace of the Church; knowing that if men sometimes cease openly to persecute the faithful, the devil never allows them any truce, and his snares are generally most to be feared in the time of the calm. St. Mark succeeded St. Sylvester in the apostolic chair on the 18th of January, 336. He held that dignity only eight months and twenty days, dying on the 7th of October following. He was buried in a cemetery in the Ardeatine Way, which has since borne his name.